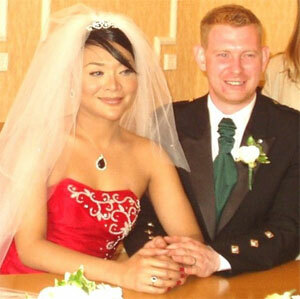 A Malaysian trans woman who had a civil partnership with a British man has won her fight to stay in the UK. Fatine Young, 36, who was born male, feared she would be arrested and jailed if returned to her home country, which would consider her relationship to be homosexual. She met 30-year-old Ian Young in 2006 while he was working in Kuala Lumpur and entered Britain on a six-month tourist visa to live with him in December 2008. The couple tied the knot in a civil partnership service in the UK in June 2009 after seeking permission from the Home Office. They now live together in Sponden, Derby. Last month, Mrs Young won her claim for asylum. She told LGBT Asylum News: “After nearly a year struggling I am so relieved that the Home Office has approved my asylum claim, knowing that I am safe from the prosecution back home. My plight, known through the media in the UK, has touched a nerve amongst the Muslim community in Malaysia. Mrs Young has also claimed she was “treated badly and humiliated” by staff at the visa processing centre because her appearance does not match the gender stated in her passport. Mr and Mrs Young say that while their family and friends have accepted their relationship, he had to leave his job as a school caretaker because parents claimed to be “uncomfortable” about their relationship. Mr Young was transferred to another school, while his wife hopes to find work in the UK.